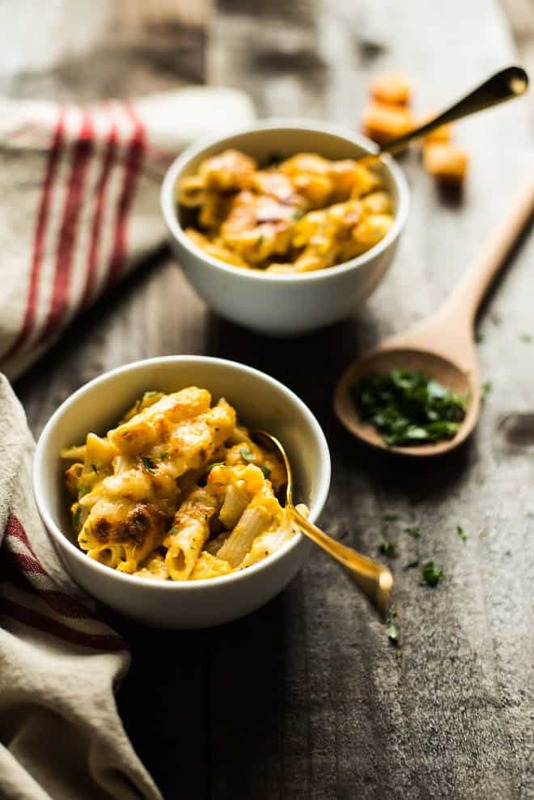 This gluten-free baked butternut squash mac and cheese is a great way to add more vegetables into a classic comfort dish! Plus, the butternut squash gives the entire dish a beautiful, natural golden orange color. This butternut squash mac and cheese recipe is a favorite at home and at my cooking classes! Note: This is an updated version of the baked butternut squash mac and cheese that I published in March 2016. I simplified the cooking method and added new photos and a video tutorial on how to make the dish. Every fall and winter, I make this butternut squash mac and cheese at least several times. It is a celebration of my favorite winter squash. Besides, I love that I can sneak in a few vegetables into a dish that we would normally deem “unhealthy.” The combination of squash, carbs, and melty cheese genuinely comforts my soul. 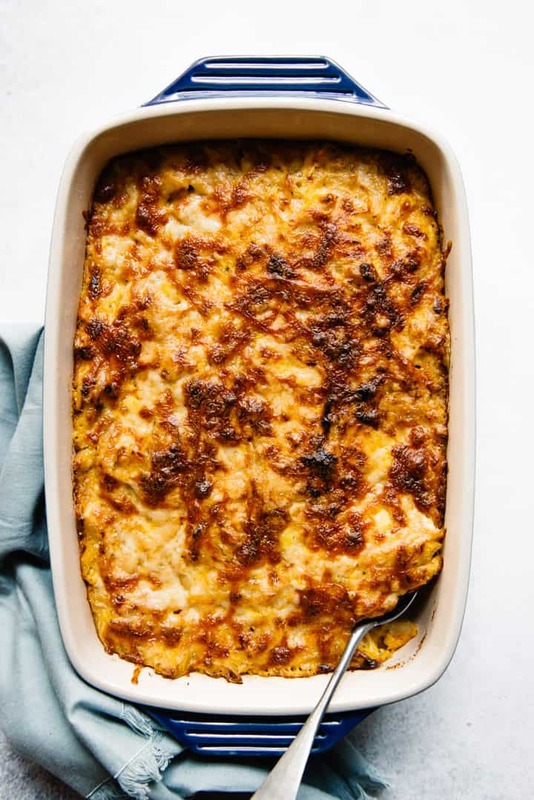 This butternut squash mac and cheese was originally inspired by the Three-Cheese Baked Mac from Better Homes & Gardens. I made a number of changes to the original recipe, including cutting the amount of cheese in half, using gluten-free pasta, and adding a butternut squash puree to the dish. The butternut squash puree move was inspired by my friend Sabrina and her baked mac with carrot. The idea of adding a bit of sweetness to a mac and cheese dish sounded so intriguing, I had to try it for myself. Friends, butternut squash in mac and cheese tastes PHENOMENAL. Choosing the right gluten-free pasta: When I first created this recipe, I was on a gluten-free diet, which is why I used gluten-free pasta. 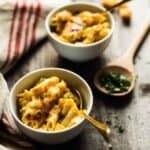 After trying out quite a number of brands, I’ve found that Ancient Harvest, Tru Roots, Bionaturae and Banza work very well for this butternut squash mac and cheese recipe. I have been eating Banza’s pasta more lately because they contain a lot more protein and dietary fiber than other pastas. Because their pastas are made from beans, you will detect a slight beany flavor in the pasta. Don’t worry, you won’t be able to detect it in this baked mac and cheese! Substitutions: This recipe works well with pumpkin puree! Adding Broccoli: I made a version of this with chopped up broccoli florets, and it tasted great. I mixed some of the florets into the mac and cheese and spread some on the top. The florets at the top get nice and crunchy! If you like my videos, I would love it if you could give it a thumbs up on YouTube! For the latest updates, subscribe to my YouTube channel. 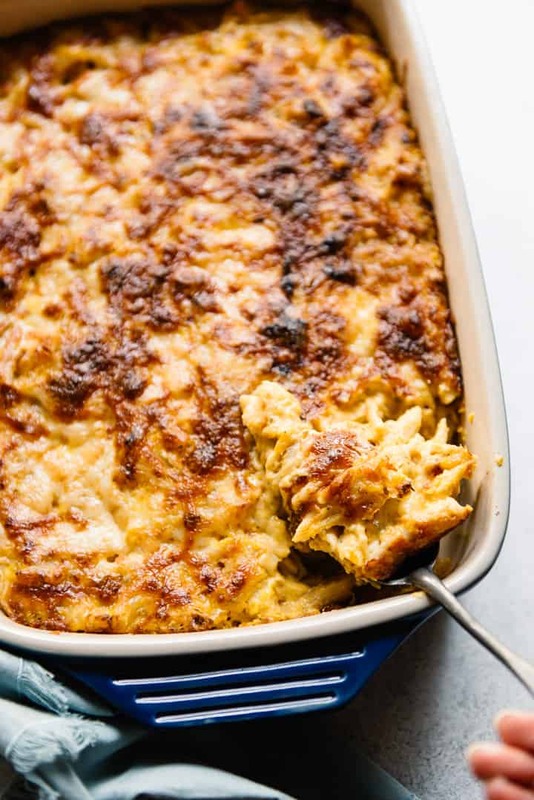 This butternut squash baked mac and cheese is great with about 1/2 to 3/4 cup of chopped broccoli florets on the top, too. Adapted from Better Homes and Gardens. Position an oven rack to the center. Preheat oven to 375ºF (190ºC). Grease a 9×13-inch baking dish with olive oil. Set aside. *In the original method, I made a butternut squash puree by sauteing 2 cups of cubed butternut squash (11 ounces) in a pan with a tablespoon of olive oil, a few cloves of crushed garlic, a splash of water and salt. The squash will need 10 minutes to cook, covered. If the water evaporates before the squash is ready, add another splash of water. Then, I blended everything in a food processor until smooth. I thought that this method was more time consuming than adding pre-made butternut squash puree into the cheese base, so I rewrote the recipe. Oh butternut squash – how I love thee more than words can describe. And in this dish I bet you give the mac and cheese a magical hint of sweetness! Augh, that daylight savings is tough. I’m still feeling it Lisa! I love this transition to Spring recipe. There’s still so much winter squash around here and in my fridge! So this is perfect. I’ve not tried hardly any GF brands because I’m not GF, but if ever that has to change, I’ll be on the lookout for Jovial and Tru Roots. Congratulations on your guest post! A lightened up favorite is always handy. Heading over there now. Thank you for this my dear! Thanks, Traci! Gluten-free pastas are definitely more expensive, but the ones that are imported from Italy are consistently good! I actually really like Trader Joe’s brown rice pastas! I think they are nice and chewy. I also love Ancient Harvest Quinoa pasta– but I’ve never tried Tru Roots. WIll give it a shot. I actually really missed pasta when I first went gluten-free– but after 4 years, I almost never think of pasta. When I make it my husband is so excited because it’s like a twice a year thing! But Mac ‘n Cheese… oooh. That’s so funny–maybe I’ve just had a bad experience with that one time. My husband loves mac and cheese, too! I have to tell you that this is probably the 12th Mac and Cheese recipe that I have tried, in order to find the perfect one. This is it! Not only is it great tasting, I got it by my 2 grandchildren who are connoisseurs of the mac and cheese. The addition of the butternut squash puree is brilliant and lends a sweetness to the dish, that no one could detect. Especially for children, its a great way to add extra veggies to a meal. I did not have mozzarella on hand so I used a creamy Havarti along with the cheddar cheese. I also omitted the oregano, worried that it might be over powering for the kids. I did keep the thyme, but reduced it by half. Added a couple more cloves of garlic…yum. Thank you for such a fabulous rendition of a classic. We all loved it…bring on more! Jan, thank you very much for trying my recipe and for your sweet comment! I’m so pleased that you and your grandchildren enjoyed the mac and cheese. I haven’t tried it with harvarti yet, but it’s definitely on the list. Honestly, reading your comment made my day! Thank you! Oh… And one more thing. I didn’t make this gluten free. I used regular macaroni. Great, fab recipe! I absolutely love this recipe and my family enjoys it as well. Only thing I did different was add Gouda cheese instead of the white cheddar(I couldn’t find it shredded) and pure request of the man in the house who needs meat, I added crab meat into the mixture and topped with bacon crumbles on top. It’s a favorite in our house now! Kortnie, thank you so much for trying it!! Oh my goodness, crab meat sounds wonderful in this casserole! I’m so glad that you and your family are enjoying this! Is there any way to sub the milk with soy milk? This recipe looks great, must try!! Hi Amy, I think it should work with soy milk instead of regular milk. Are you dairy free? If you’re also substituting the cheese for dairy-free cheese and using soy milk, I’m not sure how everything will turn out. Thanks for the recommendation! I’ll definitely need to check it out! Hi Lisa, I’m making this for thanksgiving tomorrow and I just realized it says to serve immediately. Will it still be ok if I reheat it tomorrow? Hi, Amanda! Yes, it will. Just reheat it at 350 degrees F for about 10 to 15 minutes, until everything is heated through. Let me know how it turns out! I LOVE this recipe! Made it before as written and 6 adults and 1 child finished off the entire dish in one night! I’m going to do some experimenting and see about making this recipe into the newly infamous mac and cheese hamburger buns! Fingers crossed it works!! If not I at least know the recipe is to die for!! Dana, I’m so glad that you and your family enjoyed this!! Let me know how the mac and cheese burgers turn out! I used almond milk instead of regular milk (because it’s what I had on hand) – I also added about a tablespoon of corn starch to make sure the mixture would thicken enough. I used pumpkin (again, what I had on hand) but next time will use butternut purée and a sharper cheddar for more flavor but overall loved the recipe! Oh my gosh, Katie! Thank yo so much for trying out my recipe!! Glad you enjoyed it. Pumpkin is definitely a fine substitute, too! We’ve made butternut squash many times, but it’s never been as good as when we baked it this way. Thanks so much for the idea! Thank you for trying it, Megan! This recipe is really looks awesome. The videos are really very helpful. I’m going to try it soon. Thanks for putting it together. This recipe is really looks awesome.